Diamond Peak Ski Resort usually opens around Christmas time, and is super easy to get to and enjoy. There are beginner runs, lessons for all ages, a terrain park for snowboarders, intermediate and advanced runs, and some views of the lake too! Best of all, residents get heavily discounted single tickets and season passes, so it's easy to justify an afternoon on the slopes here or there. Want to be really close to Diamond Peak and enjoy a view of the slopes? Live in a ski condo in the Incline Village Diamond Peak area. Consider Bitterbrush if you want a view of Diamond Peak skiing along with a super close location to the slopes. No need to worry about waiting a while for a table at Azzaras or Bite (two locals' favorites restaurants in Incline) in the winter, except maybe for Saturday night. Even though Diamond Peak Ski Resort brings visitors to Incline Village, the crowds don't reach the summer volume. The Incline Beach is available during the winter as well, and is a great way to enjoy the outdoors on a sunny winter day. Dogs are allowed at the Incline Beach in the winter. 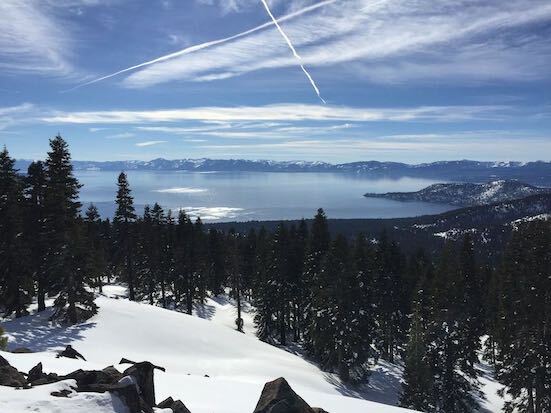 Head up to the Mount Rose Meadows for a quiet snowshoe trek. You can also stop at one of the pull-outs on the way up to Mount Rose to get in the back country where you won't see another person and can enjoy some Lake Tahoe Views. Have the kids or grandkids along? Head up to the Mount Rose Meadows for a great sledding hill. The Homeowner's associations for most Incline Village condo and townhome communities take on the task of clearing snow from the driveways and parking areas. This is great for second homeowners, because you can come up for just a weekend knowing you can get in your garage or parking spot without having to shovel or get out a snow blower. Want to know more about living in Incline Village in the winter? I'm a full time resident and Real Estate Professional and can answer your questions as well as finding the best place for you. Contact me! Be close to skiing in the Diamond Peak area of Incline Village. Towering in front of most of this area is the Diamond Peak ski mountain, which is a pretty sight to see in both summer and winter. Drive up the main road, Ski Way, and you'll climb in elevation quickly. That makes views of both the lake and mountain more common. Next to the Diamond Peak ski resort is the Big Water Grill, a locals favorite apres ski or any time.